ANDREW THAYER TTN File Photo Junior finance major Will Sabate (left) brought SwoopTEXT to Main Campus with the intention of making intraorganizational communication more effective. After its Fall 2011 introduction, SwoopTEXT catches on among various student organizations to streamline their communication efforts. Aimed at providing a means of communication for student organizations, SwoopTEXT went live on Main Campus in Fall 2011. Since its inception at Temple, student organizations have found success in utilizing the program to connect with members. The idea for SwoopText was pitched to a professor at Princeton University who liked the idea and ran a trial version of the system for graduation at the school. Through SwoopTEXT, student groups can register online and use the website to send timely text messages to members. University email addresses are required to access the website. After a trial version of the system was tested at Princeton, SwoopTEXT spread to colleges along the East Coast. “What we’re trying hard to do is educate student leaders on how to use it, raise awareness about it more and just get folks set up,” Keaton said. 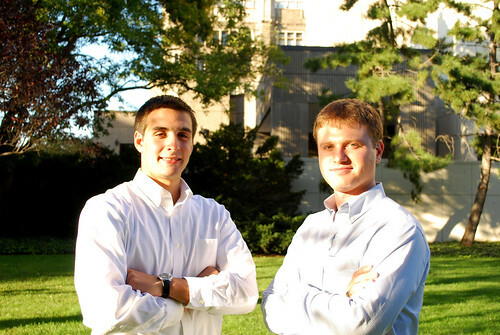 Keaton and Michael Pearl created SwoopTEXT at Princeton to make student organization communications smoother and more convenient. Junior finance major Will Sabate and others collaborated with Keaton and Pearl when bringing the program to Temple. Five student organizations, such as WHIP radio, Insomnia Theater and FoxMIS are using the SwoopTEXT application. “The factor that sticks out the most to me about the app is that it utilizes a computer-mobile phone hybrid that I had not previously seen on this scale,” said Pete Grant, president of the Financial Management Association at Fox School of Business. Due to the amount of correspondence that Grant has with his members through emails and newsletters, the organization elected to use SwoopTEXT as a sort of “emergency communication” platform. SwoopTEXT is tailored more toward student groups than other social media sites like Facebook and Twitter, and provides free, unlimited texting for students for groups that choose to opt-in to the system. With SwoopTEXT being well received by university organizations, both Sabate and Keaton are already looking forward toward the future by working on a number of exciting features to improve the user experience of SwoopTEXT. Plans of mobile-to-mobile technology are already in the planning stages. Sabate and Keaton are also exploring the use of “short codes” to streamline the signup process. This feature would allow users to opt in to groups without necessarily creating a profile on our web platform. Sabate said that these features will be available to students as soon as they are developed and tested. Dominique Johnson can be reached at dominque.johnson@temple.edu.